A prayer service offered once a month(typically, please check the calendar) on behalf of those who are affected by alcoholism and other addictions. Who can come to the service? The service is open to anyone who would like to come. All are welcome. The service is especially for those who personally struggle with addiction of any kind. The service is especially for those who are friends and family to those who struggle with addiction of any kind. The service is especially for those who work in the field of recovery addiction. You will not be asked for anything. You will not be made to stand up or be singled out in anyway. This is a time reserved to quietly pray for healing for yourself and others. The service is about 45 minutes long. Most of the service will be chanted. There are service books for you to read along. During the service a slip of paper will be passed around to write the first names of people who need healing in the area of addiction. Towards the end of the service these names will be prayed for one by one. On some occasions there will be a light meal afterwards. A Russian Peasant, a retired soldier, was an alcoholic. He would drink away all his pension, everything that he possessed, anything that could be found in his house. Eventually he was ruined, and became a beggar. His legs slowly became paralysed, but still he continued drinking. Without a penny to his name, and having no use of his legs, the man did not dare to go on a journey. But the holy man came to him a second, and then a third time, and was so adamant in his admonition to obey his instructions, that the poor drunk did not dare to disobey any more, and he set off as quickly as he could, dragging himself on all fours. In one of the neighboring villages where he stopped to rest, an old woman took him in for the night. To ease his pain, she massaged his legs, and put him to rest on top of the clay oven – a customary place for the old or sickly, because of the warmth. During the night the travelling man felt a pleasant sensation in his legs, and discovered that he was able to stand. On the following nights his legs became even stronger. And so, first with two walking-sticks, and then with just one, he arrived in Serpoukhov. Once in the monastery, he told about his visions, and asked to have the prayer service. But nobody there had ever heard of such an icon. They started to search for it, and noticed one that was hanging in a passage that bore an image of a chalice. 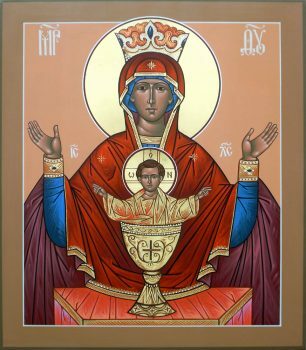 On the back of it, to their surprise, was written “The Inexhaustible Cup.” And in the icon of St. Varlaam, the man immediately recognised the face of the holy elder who had appeared to him in his dream. From Serpoukhov the man departed, completely healed. The news about the miraculous icon spread quickly through the city, the region, and all of Rus’. Alcoholics and their families and friends, were coming to pray before the Mother of God for healing, and in time many came back to thank her for her speedy help. The prayer service (called and Akathist) that we offer at St. George on a monthly basis was composed in thanksgiving for these events, and asks that they would be granted again.